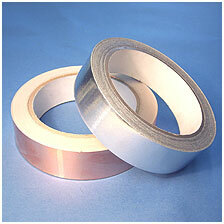 Typically the section core material is polyurethane offering low compression force and good recovery. 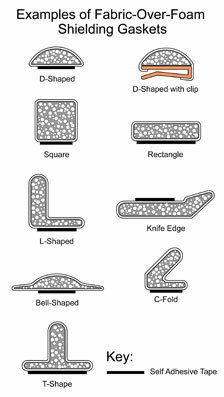 Certain profiles, particularly those with thin sections, incorporate stiffeners so as to improve the gasket function. The metallized fabric covering has an inherently low friction or free sliding surface making some gasket profiles suitable for applications that involve a ‘wiping’ action. Numerous other special purpose profiles are available so please provide details of your application and allow us to make a recommendation. Most sections are available with self adhesive backing for ease of fitting. Additionally there are certain sections such as some ‘C’ fold and ‘D’ profiles are available mounted on a clip strip for convenient mounting on to panel edges. 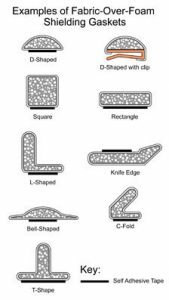 Gasket cross-section sizes can accommodate clearances from less than 1mm to over 20mm. 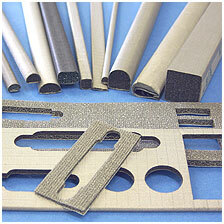 These profiles are normally supplied as standard cut lengths, the exact length (1 – 3m typically) depending on type. 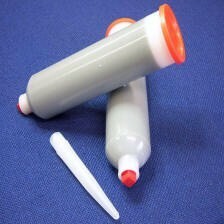 If required we can supply your gasket as a kit i.e. parts cut to length, mitred corners etc, ready to be assembled into place. 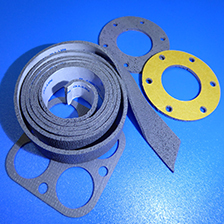 Conductive fabric wrapped gaskets can also be fabricated as a single piece to suit I/O panels found on many types of equipment. This allows multiple connector positions/apertures to be very efficiently shielded by the application of a single gasket. 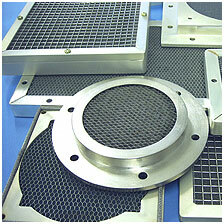 Small sections of these gasket types can be used as grounding pads.